Dubai, UAE – 28 January 2019: With Valentine's Day just around the corner, shower your loved ones with romantic gestures that they will surely adore. 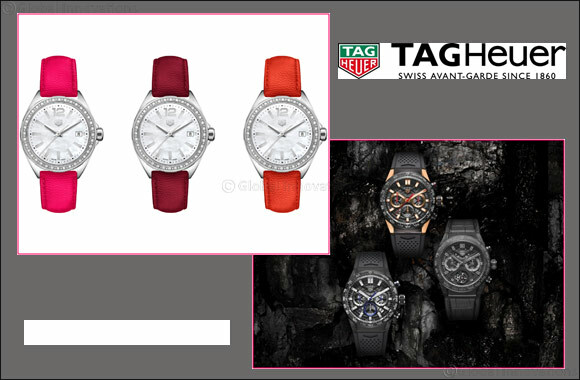 TAG Heuer presents its top “for her” and “for him” timepieces for Valentine's Day. The TAG Heuer Formula 1 Lady and TAG Heuer Carrera timepieces are the perfect gift to celebrate the beauty of your love and illustrate that true love is timeless. This glamorous TAG Heuer Formula 1 Lady watch is designed for women who live life on their own terms. With 8 personalized and interchangeable strap colours including Hot Pink, Burgundy and Orange, there is a spectrum of passionate colours to choose from. Each detail of the watch bears the hallmarks of the TAG Heuer Formula 1 series and has been reworked to give the piece elegance and feminine curves. The TAG Heuer Carrera collection, all crafted in carbon, is inspired by the famous Carrera Panamericana road race and remains one of TAG Heuer's most popular and sought-after timepieces. Carrera watches truly underscore TAG Heuer's superior status in the world of avant-garde watchmaking and are the perfect gift for that special man in your life, with each model having its own daring personality.